Mount it on heavy paper. Cut around the solid black lines. Fold tabs on the colored lines to make a box. Glue the flaps. 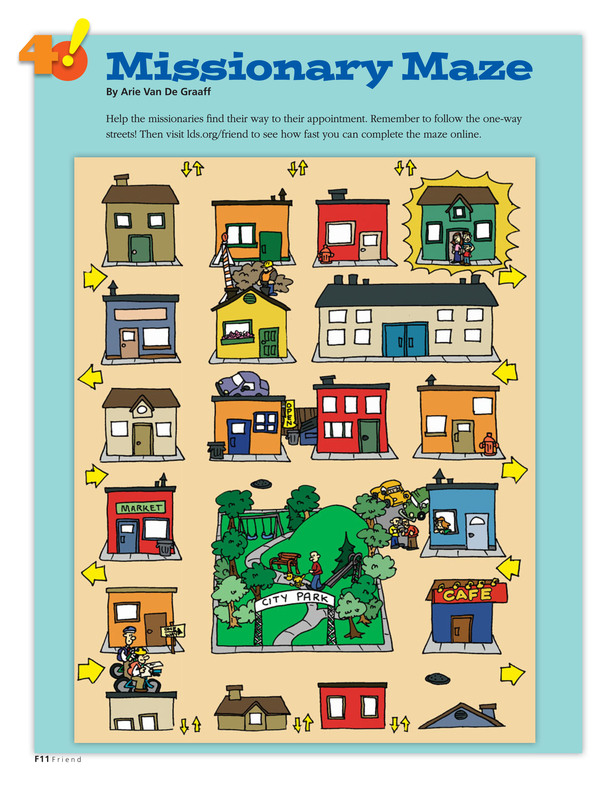 You and your family can play this game to help you remember to be a missionary now. 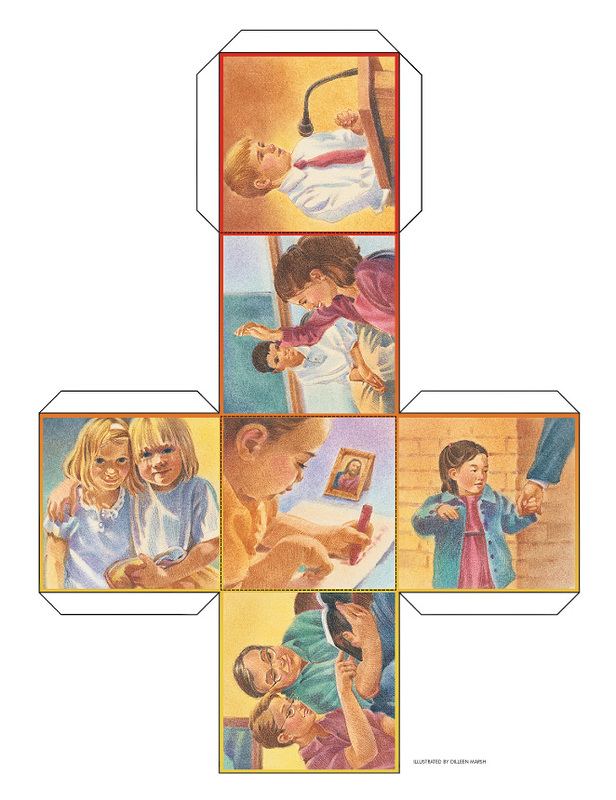 Take turns rolling the box, looking at the picture on the top, and telling how to be a missionary in that pictured situation. Let your light so shine before men, that they may see your good works, and glorify your Father which is in heaven (Matt. 5:16). For several days and nights. 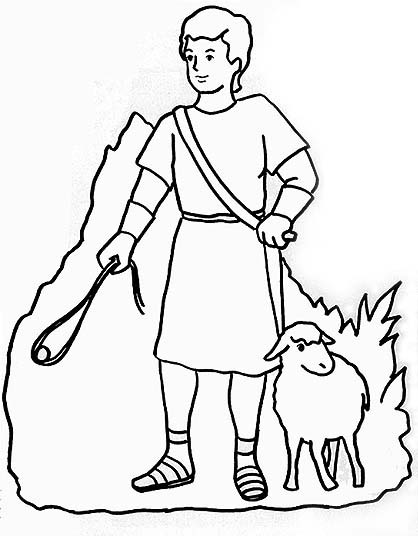 “Book of Mormon Stories,” by Elizabeth Fetzer Bates, is from Sing with Me, B-87; for additional verse, see Children’s Sacrament Meeting Presentation 1988, page 3. 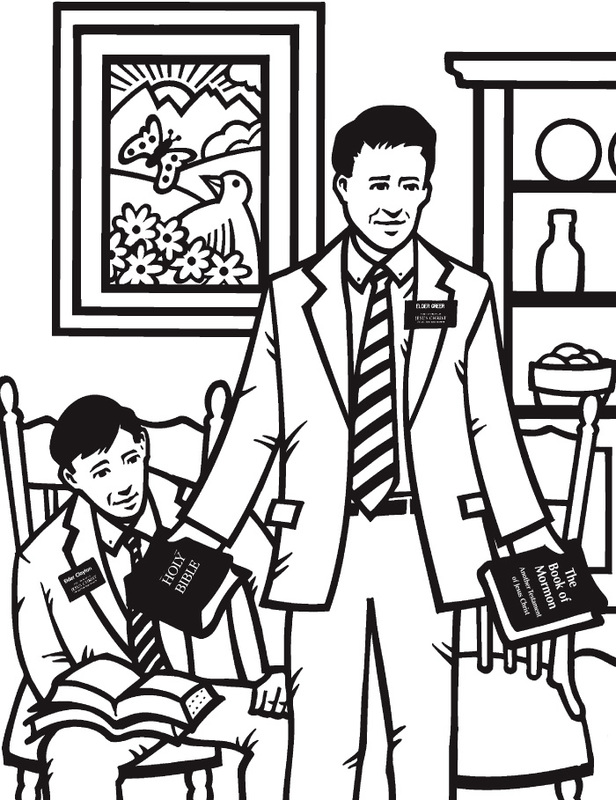 Make missionary finger puppets by coloring those on page 45. 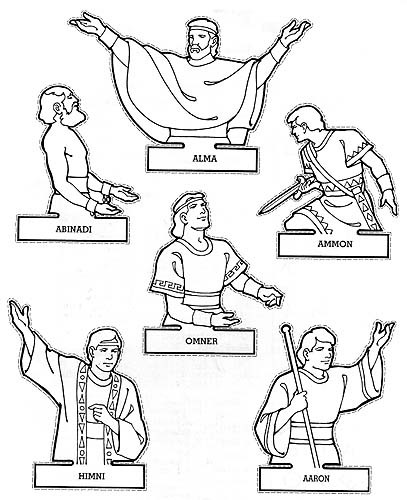 Then, on a separate piece of paper, draw and label more finger puppets to represent other missionaries you know and love—the missionaries who brought the gospel to your family; brothers, sisters, grandparents, or other relatives or friends who have served or are serving as missionaries—and a finger puppet of yourself! Cut out each puppet, form the label into a circle to fit your finger, and tape closed. Place the puppets on your fingers and tell about these missionaries who publish peace. 1. Jonathan looked at the clock for the eighth time. “Is it time for family home evening?” he asked again. 2. “Yes, we can start now,” Dad said with a smile. 3. Jonathan and his sister, Michelle, were excited. They put paper, pencils, watercolors, and crayons on the table. Everyone sat down on their chairs and folded their arms. 4. After the prayer Dad picked up a letter and read it to them. It was from Uncle Eddie. 5. Uncle Eddie was a missionary in Central America. Jonathan liked to hear about the boys and girls there. 6. When Dad finished reading the letter, everyone began to draw a picture or write a letter to Uncle Eddie. Jonathan drew a picture of Uncle Eddie riding his bike. He drew a picture of him flying away in an airplane to Central America. Then he drew a picture of him teaching a family. 7. “When you are finished, fold your letters and drawings, and we’ll put them in this envelope,” Dad said.